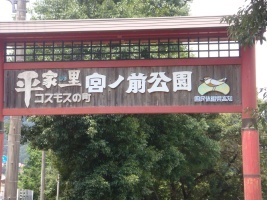 Ochi town is located in the center of Kochi prefecture, and it’s surrounded by Mt. Ishizuchi, which is the highest mountain in western Japan. Clean water comes from the mountain, and it provides Ochi town with a great nature. Another thing which brings a great nature to Ochi town is Niyodo River. It is a first-class river running through Kochi and Ehime. 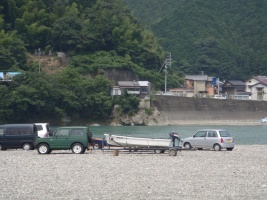 The river is the third biggest river in Shikoku, and its water quality is said to rank fourth in Japan. People in Ochi are also very nice. They have an important work every spring. 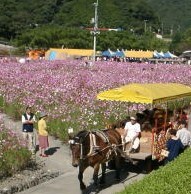 Many people get together and plant cosmoses in Miyanomae Park, where Cosmos Festival is held every autumn. The park is about 32,000 square meters, and it is filled with cosmoses during Cosmos Festival. How many cosmoses are there? Lo and behold! There are more than 1,500,000 cosmoses and they are all planted by people in Ochi town as a volunteer activity! But one question came up to my mind. Why can they do such a tough work without any rewards? “The answer is simple.” said Ms. Matsumoto, an office staff of Tourist Association in Ochi. “It’s just because we all love our town. If our town gets vitalized, we get really happy! We all look forward to the festival.” I realized that their loves make the exquisitely wonderful festival. 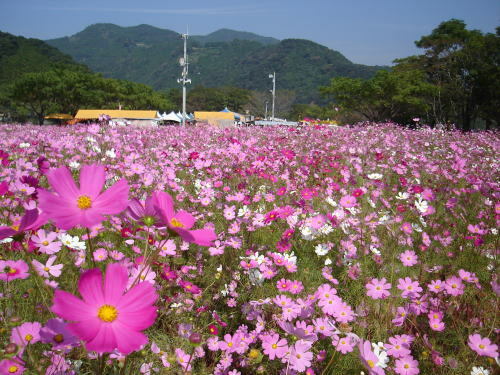 Cosmos Festival is being held for about half a month. Some people may worry that they can’t enjoy enough by only watching cosmoses. But there’s no need to worry about it! The host of this festival tries various measures to amuse visitors. Hana-basya is one of the popular events of the festival. It’s a horse-drawn carriage that takes visitors around the park. The horse comes from Miyazaki prefecture, and it’s called Hanako. The park is a little bit large, so this event is good for elderly people or a family with small children. Some other special events are held every weekend during the festival. For example, visitors can enjoy the concert conducted by students who belongs to a brass band club in Ochi junior high school, and they can also join the karaoke competition. Of course, it goes without saying that there are many street stalls during the festival. Everybody believed that they can hold the festival this year as has happened in the past, and they were all looking forward to it, but the god really can be really capricious. A tragic drama unfolded on July 19th, when a powerful typhoon attacked Kochi. It brought a lot of rain in many areas. Some areas in Kochi prefecture had the heaviest rainfall on record at the Meteorological Agency. It rained more than 1,000 mm a day. The following figure shows the amount of rainfall brought by the typhoon. The red parts are districts where people living there should go to somewhere safe or keep on the alert against the rain. 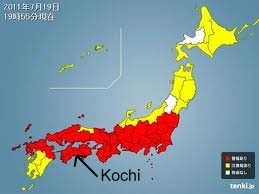 According to the Meteorological Agency, Kochi had the most rainfall in Japan in 2010, and it rained 2,547.5 mm this year. This typhoon, however, brought more than 1,000 mm only in one day. That means the rainfall of this day is almost equivalent to that of a half year! You can easily guess how terrible it was. All the cosmoses people in Ochi town had planted in Miyanomae Park were damaged because Niyodo River overran and the water submerged Miyanomae Park. Many people got depressed. But the day after the typhoon had gone, people gathered there and they started cleaning the park to plant cosmoses again. Nobody forced them to do that: they all voluntarily got together. Amazingly, three fire-extinguishing vehicles went to the park to help people remove the mud in the park. Ms. Matsumoto said, “Cosmos Festival is our dream itself. The similar festival is held in many places not only in Kochi prefecture but also in other prefectures in Japan. But we believe that the one in Ochi town is the best! So we shouldn’t give up the festival.” Her eyes were full of brightness. In Miyanomae Park, I saw a plowed field. I couldn’t imagine that the typhoon had attacked there only a week ago. It was well-mended. When I was looking at the field where cosmoses were planted, an old woman walked up to me and asked, “Do you know the floral language of a cosmos?” She suddenly asked me such a question, so I was at a loss what to answer. She continued, “Generally, a cosmos means the purity and the sincerity. But it has different meanings by the colors: the red cosmos means the harmony; the pink one means the love; the yellow one means the beauty of the nature; and the white one means the cleanliness. The flower has so many wonderful meanings. Planting cosmoses in our town represents our love toward our town. I’m really proud of Cosmos Festival being held in Ochi town.” She said that she has planted cosmoses since Cosmos Festival first took place in Ochi town. The festival has a 30-year-old history, but these days, the frequency of abnormal weather has been increasing. She worries whether Ochi town can continue this festival in the days ahead. It is said that growing cosmoses is very easy compared to other kinds of flowers. But growing great cosmoses like the ones in Ochi town needs a hard work. Not only that, but also good environment like the strong sunshine and the clean water make the cosmoses look even more lush and beautiful. However, what makes them wonderful the most is the love given by warm people in Ochi town. I was impressed with your article of the part of the tragic dorama. And I didn’t know a cosmos has meaning each of the color.